Discussion of the Developer for Java Web Services exam certification. 1Z0-897 - Does it make sense? Clients against the Amazon E-Commerce service. Am I crazy for trying this Certification Exam? How can I apply Restriction and attribute both for a simple Element in XSD ? 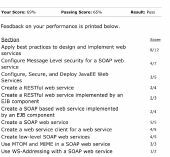 What is the best source to use to study for the Java EE 6 Web Services Developer Exam?